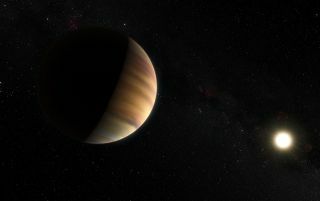 An artist's impression of the first planet orbiting a sunlike star beyond the solar system, 51 Pegasi b, a massive gas giant orbiting its planet every 4 days. It's been 20 years since scientists first announced the discovery of a planet outside Earth's solar system orbiting a sunlike star. Since then, the study of exoplanets has grown dramatically. Space.com caught up with Michel Mayor, professor emeritus at the University of Geneva and the Geneva Observatory, to discuss how the understanding of exoplanets has evolved over the last two decades. In October 1995, Mayor, along with Didier Queloz, also a professor at the University of Geneva, announced the discovery of 51 Pegasi b, a massive Jupiter-sized planet orbiting its sunlike star every four days. Although these "hot" Jupiters (so named because they sit very close to their parent star) are familiar to astronomer today, at that time they were only a theory, and one that not everyone endorsed, Mayor said. To find these close-orbiting behemoths, astronomers relied on a technique known as the radial velocity method. As a massive world circles its star, the planet's gravity very slightly shifts the light of its sun. The bigger or closer the planet, the easier it was to spot the signal, so astronomers around the world turned their attention to finding those hot Jupiters. Theorists, however, weren't quite convinced. Only a few months earlier, a paper published in the journal Science claimed massive giants would not be found close to their star because the material that formed them was only found at greater distances. At that point, Mayor and Queloz had already gotten their first hint that something curious was happening around 51 Pegasi, so they remained undeterred. "We were not troubled at all," Mayor said. They continued to wait for the next opportunity to view the star, in order to strengthen their research. In July, they confirmed that 51 Pegasi b was, in fact, a planet. They published their finding in the November 1995 issue of the journal Nature. Less than a week later, the planet was confirmed by Geoffrey Marcy and Paul Butler, an independent team working out of the University of California, Berkeley. Lying 51 light-years from Earth, 51 Pegasi is a sunlike star in the constellation Pegasus. Its only known planet, 51 Pegasi b, lies closer to the star than Mercury does to the sun, whipping around it every 4 days. But the planet isn't rocky like Mercury; it weighs in at half the mass of Jupiter. The fast-orbiting planet proved to be the first of many planets orbiting stars other than the sun. Through the latter 1990s, astronomers used the radial velocity method to find an increasing number of hot planets that orbited close to their parent star. Then, according to Mayor, just before the turn of the century, astronomers began using a new way to identify worlds outside of the solar system — the transit method. A transiting planet crosses between its parent star and the Earth as it orbits. As the planet briefly passes in front of the star (as seen from Earth), scientists can measure the temporary drop in the brightness of the star, and calculate the radius of the transiting world. "This was the real start of his huge field of transiting planets," Mayor said. More and more exoplanets trickled in over the next decade. Then, in 2009, NASA launched its Kepler Space Telescope, an instrument that used the transit method to search for distant worlds. Since its first major results were announced in 2010, Kepler has revealed over a thousand confirmed planets, and nearly 5000 more candidates. According to NASA, the discovery of 51 Pegasi b played a significant role in launching Kepler into space. Thanks to the wealth of worlds spotted by Kepler, along with planets discovered in the decade and a half before its launch, astronomers estimate that closely orbiting gas giants are actually rather rare specimens, despite dominating exoplanet studies for more than ten years. Less than 1 percent of all stars host hot Jupiters, according to Mayor. But when I asked if that means he and Queloz got lucky with their find, he laughed. "We were not lucky at all," he said. That's because the pair didn't pin all their hopes on a single sun, he explained. They examined more than 140 stars in their quest for a single hot Jupiter. Statistically, at least one of those should have hosted a toasty giant, although at the time they didn't know how common — or uncommon — such worlds are. What they did bank on was the fact that somewhere in the galaxy, a Jupiter-sized planet orbited extremely close to its sun. According to Mayor, at the same time he was scanning the stars for 51 Pegasi b, another team focused on systems with distant Jupiters, with orbits closer to those of the gas giants in Earth's solar system. That team focused on a smaller sample of stars, and searched over a longer span of years, Mayor said. But, he added, they received less telescope time than the Geneva team — 6 to 8 nights per year, compared to the 42 nights Mayor and Queloz received. "They probably had better weather, but we had more nights," Mayor said. The last two decades have seen a revolution not only in how scientists hunt for worlds beyond the solar system, but also their understanding of what these systems might be like. Before 51 Pegasi b, most astronomers had the idea that the solar system was an average group of planets. But the collections found around other stars differ significantly from the solar neighborhood, with hot Jupiters, tightly packed inner planets, or a scarcity of rocky worlds. Astronomers are no longer quite as concerned about just finding planets, but are beginning to focus on how planets form and whether they could potentially host life. By studying the radius and mass of worlds, scientists are able to better understand a planet's density, which gives an idea of what the planet could be made of. Scientists probe the upper layers of the atmosphere of distant worlds, searching for signs of what the air is made of. And scientists seek to understand planets as a whole, as well as individually — how they form and what makes them tick, two things that help them better understand Earth, as well. The Kepler mission ended in 2012 when two of its reaction wheels failed, limiting its ability to study distant worlds. A second mission, known as K2, put the telescope back to work, studying exoplanets on a more limited scale. NASA's James Webb Space Telescope is scheduled to launch in 2018, and it will carry on the study of exoplanets, Mayor said. Other large telescopes under construction on the ground, such as the Extremely Large Telescope and the Giant Magellan Telescope, which should be completed in the mid-2020s, will help further characterize these far away worlds. Although only a handful of scientists were part of the original hunt for exoplanets, the numbers have swelled. The Extreme Solar Systems III conference hosted over 300 scientists, but Mayor said this was a fraction of the total number of people now examining other worlds, as Europe and Asia remained underrepresented. He estimated that several thousand people today make up the field. "I could not imagine 20 years ago that the fist detection would have such big consequences," Mayor said. "It's so incredible."